I recently decided to try my hand at making kettle-style popcorn. Basically, you add sugar and a little salt along with the kernels to the hot oil, and then you have to shake the pot like crazy to keep the sugar from burning. It tastes good, but I am not sure it is worth the effort of having to keep such a close eye on it to keep it from burning. And believe me, the smell of burnt kettle-style popcorn is something you want to avoid at all costs. But I liked the idea of it and started to think about how I could make something similar without having to be so careful about it. Then I remembered by freshman year of college, the year I lived in a dorm. We were not allowed to cook in our rooms. The only kitchen appliance we were allowed to have was a popcorn popper. In those days, plastic popcorn poppers were becoming the norm, but I knew I wanted a metal one. Why, you ask? Because you can make so much more than popcorn in a metal popcorn popper. They operate on the same principle as the Easy-bake oven, only instead of light bulbs they use heated coils. The coils are on the base, and you put the metal bowl on top of it and fill it with the popcorn and oil. But, you can also fill it with water and Rice-a-Roni (this was before the days of five-for-a-dollar ramen soup packets and Rice-a-Roni was the cheapest thing around). Or mac and cheese. Or even brownie mix. Quite versatile. But I mainly used it for popcorn. I don't remember if she had ever done it before, but when one of my floor-mates suggested that we put Red Hots into the bowl along with the kernels and the oil, it seemed a reasonable enough thing to do, to an 18-year old with few cooking skills, at any rate. To my delight, it worked. Instant cinnamon-flavored popcorn. The candy melted and coated the popcorn as the kernels popped. You do have to be careful not to let it burn at the end, but you do not have to shake it constantly while it is popping. It is the easiest form of sugared popcorn that I have seen. When I first remembered this and went looking for Red Hots, I had some trouble finding them. They used to be a staple in the drugstore candy aisle, but I did not find them at Walgreen's, or Jewel/Osco. I finally found them at my neighborhood Treasure Island. Once again my local grocery store comes through! There is one slight drawback. The pan will end up with bits of cinnamon candy stuck to it. But a quick soak in hot water takes care of that. It is well worth it when you want to fancy up your popcorn. Pour the oil in the bottom of a 3 or 4-quart pot with a heavy bottom. Add the popcorn, then gently pour the red hots over the popcorn. Place the pot over medium-high heat and cover, leaving the lid slightly ajar. When the popcorn starts popping, remove from the pan for 1 minute, then place it back over the medium-high heat and let it pop until the popping has slowed down, shaking it gently back and forth as the popping starts to slow down, if you like. Do not let it go more than 3 seconds without hearing a pop. Remove from the heat immediately and pour it into a large bowl. Sprinkle with a little salt and stir it up to break apart the kernels (because of the melted candy, the popcorn will be sticking together in clumps). Chopsticks are a handy tool to use to separate the kernels. 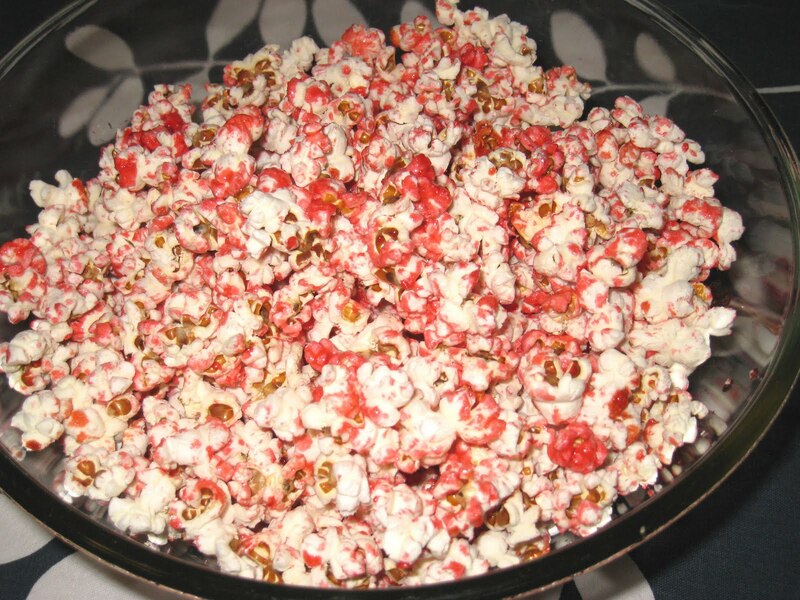 That's a pretty interesting story about how you got the idea of red popcorn. Anyway thank you for sharing this recipe, I'm so excited to make it because I believe it tastes good.